One of the more common cruiser classes in independent hands is the old Boadicea class cruiser. 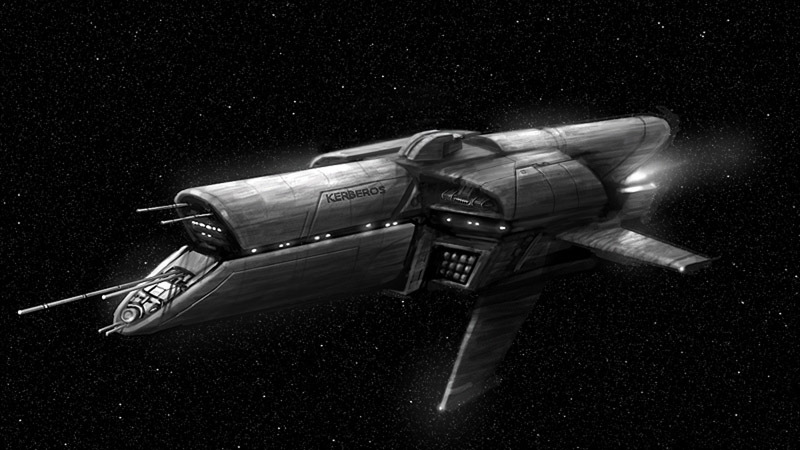 Originally built by the Human Alliance but long retired, the ship might be considered the ancient equivalent of the Warshield class in contemporary service. Even though old, there is a surprising number still remaining operational. Of course compared to modern warships, they are slow, lightly armored, and lacking in force field protection. In general, their firepower might be considered adequate but even there many newer vessels of similar class do have greater firepower. As a result of these ships weakness, most have been modified and upgraded in order to allow them to remain effective. Many are almost complete rebuilds in fact. There are few available cruisers and only a relatively few sources of them outside of major government. Interesting, it is sometimes almost as expensive to rebuild a vessel than to build a new warship. Still, while a smaller yard or even a repair ship might be able to rebuild a cruiser, only the largest of yards can actually build them from the keel up. As such, rebuilding a cruiser makes sense even in many cases if not cost effective. The cruiser that became the Lagertha has an interesting past. Probably the one most intriguing is that the whole stern area of the vessel was wrecked, not in battle but in a collision during a docking maneuver. One might have though that the ship would simply be scrapped after that. Instead, the stern areas of another Boadicea class cruiser was used to repair the cruiser. In most respects, the other cruiser was in worse shape and had been stripped. In fact, it was headed for being scrapped at the times. As a result, it made sense to use the stern of it to repair the Lagertha. The result though was a cruiser slightly longer than most in the class because they were not mated together in exactly the same place. It has been suggested that the workers made a mistake in where they cut the two vessels and fused them back together. Before the stern was attached, it was decided to take the opportunity to replace both the old propulsion plant and the fusion reactor. Even though the replacement faster than light drive is a civilian model, it comes from a fast cargo ship and gives almost twice the speed of the original. Normal space acceleration is also vastly improved on the Lagertha compared to the standard Boadicea class cruiser. The fusion reactor is also a civilian model, much smaller than the original while providing far greater power. There were concerns with the strength of the juncture between the new stern and the rest of the vessel. As a result, there was an extensive effort given to reinforcing the mating of the two sections. At the same time, the hull was generally reinforced and additional armor added to various areas. Even so, the Lagertha can be considered nowhere near as tough as newer vessels such as the Warshield. As with many of the systems, the force field generator was considered hopelessly obsolete. Compared to a modern system, it produces a fraction of the output while being far more massive. As with the propulsion and reactor, it was decided to replace it with a civilian model from a military fleet support design. With respect to the weapon, initially weaponry was retained. However, power conduits, junctions, and wave gives were replaced with respect to the ship’s heavy energy battery. As one might expect, sensors were modernized and have been modernize several times since. Since then, much of the weaponry has been upgraded or replaced although completed in stages. First upgrade was removing two of the mini-missile batteries, retaining four, and mounting four civilian model medium range missile batteries. These are basically civilian models but do have greater magazine space than standard. Part of the space for the magazines is due to the extension in the Lagertha’s length. Next was the replacement of both the long range and capital missile batteries with modern systems. These enable the cruiser to fire larger volleys than it could originally although magazine space is still less than a Warshield class cruiser. The ship normally carries fusion capital missile warheads because both X-Ray laser and anti-matter warheads are rare outsider of the major powers. The third upgrade was replacing the original point defense lasers with variable focus particle beams in order to give far better defensive firepower. They are considered far more effective than the original laser against missiles with both better range and energy throughput. It was decided to retain the conventional rail guns because they are easier to maintain than gravity type rail guns. As a final major upgrade, two of the 12 cm lasers were removed and replaced by two 20 cm heavy electromagnetic mass drivers. The other two 12 cm lasers as well as the 28 cm particle beams are retained. These heavy mass drivers fire a single heavy projectile at a time although there are multi-projectile which are extremely effective against smaller targets including being able to act in the anti-missile defense role. Developed by the Tri-Galactic Military Service, the weapon system is considered experimental and currently only mounted on a few vessels. At the same time, the electronics were upgraded so that the cruiser could control up to twelve “Pepperbox” cruise missile launchers. The standard Boadicea class cruiser embarks a single squadron of fighters. When the ship was rebuilt, the hangers were extended. This enables the ship to carry two squadrons of light fighters. The ship originally carried the Venom light fighter but has recently been upgraded to the “Venom-X” model. Marine compliment is also increased with the additional of a space power armor unit. The ship carries a total of ten Ironmonger Forges “Warhawk” space combat exoskeletons along with the same number of “Knock Off” K-Universal armors. One advantage of the new systems is that the ship can be operated by a smaller crew than the original Boadicea class. Instead of requiring a crew of almost three hundred and fifty, the Lagertha requires a crew of just over two hundred and ninety. Crew quarters have been modernized but are not redesigned for greater space per crew member and are considered a bit on the cramped side by modern standards. 294 (25 officers, 269 enlisted). 60 marines ( typically stay on board for ship defense), 36 fighter pilots, 10 space power armor pilots, and 10 ground armor pilots. IM-WHK-5-SN “Warhawk” Space Combat Exoskeletons. TMS “Pepper Box" Cruise Missile Launching System (Optional - External). 4,000 a side (24,000 total). Atmospheric Propulsion: Maximum speed is 400 mph (643.7 kph), can enter an atmosphere and can leave but is not designed for atmospheric flight. Length: 620 feet (188.98 meters). Height: 145 feet (44.20 meters). Width: 240 feet (73.15 meters). Weight/Mass: 124,000 tons (112,490 metric tons). Cargo: Cargo holds are scattered about the ship that allows for carrying up to 5,000 tons (4,536 metric tons) of cargo in addition to standard compliment of supplies and ammunition. Each enlisted crew member has a small locker for personal items and uniforms. Ship’s officers have more space for personal items. Most of the ship’s spaces are taken up by extra ammunition, armor, troops, weapons, engine, and other equipment. Market Cost: Unmodified Boadicea class cruiser would cost about 1.2 billion credits to manufacture in present time in the Three Galaxies. Ships are no longer being produced. When available, these ships sell for 2.0 to 3.5 billion credits. As refitted, the Lagertha would probably be worth around 5.5 to 6.8 billion credits. Cost does not include embarked craft. Two (2) Main 28 cm Particle Beam Batteries: In the front of the ship are two 28 cm particle beam cannons. Weapon has standard minuses to hit fighters and small targets. These can be fired forward and can be angled up to 120 degrees aft (can only fire one cannon at a target at that angle but can spin to be able to bring both batteries to bear) and can fire at a 30 degree angle up or down. The weapon system cannot be used to engage targets while traveling at faster than light velocities. Two (2) 12 cm Heavy Laser Cannons: Laser cannons are used against frigates and as against heavily reinforced targets. Two are located on either side of ship. Weapon has standard minuses to hit fighters and small targets. The barrels can be can be rotated 180 degrees in all directions. Only two cannons can be fired as one volley. The weapon system cannot be used to engage targets while traveling at faster than light velocities. Two (2) 20 cm Heavy Electromagnetic Mass Drivers: These weapon systems replace two of the 12 cm laser mounts although individual mounts are far larger. These weapon systems are designed to be especially effective against targets which are impervious to energy. Instead of firing bursts of smaller projectiles, the mass driver fires a massive high density projectile at a target at incredible velocity. Each projectile masses approximately half a ton and relies on pure kinetic energy instead of explosives. Even though the projectile is fire by a powerful electromagnetic rail gun, the projectile does use a low powered contra-grav maneuvering system. This is only designed to give limited guidance against targets. Projectile guidance uses a short range radar system (Gives +1 to strike.) As the projectile has relatively low maneuverability, it has standard penalties to hit small targets such as fighters, power armors, and missiles. When projectile reaches maximum range, it is no longer guided but can be used effectively against unmoving targets in a similar manner to missiles (has same penalties.) The projectile is slower than light speed and cannot be used effectively when the starship is traveling at faster than the speeds of light. In addition to a single heavy anti-starship projectile, the mass drive can fire a larger projectile containing eight smaller kinetic kill projectiles. As with the full scale projectile, each smaller projectile is guided and is extremely effective against smaller target such as missiles, power armors, and fighters. These smaller projectiles are extremely useful as additional point defense against missiles. As with the larger projectile, there projectiles uses a short range radar system (Gives +1 to strike.) Unlike missiles, volleys of four or more of these projectiles can be dodged. So that projectiles can be fired through an atmosphere, the main projectile casing is fitted with a heat shield - half damage from plasma type weapons. Single solid projectiles have 80 M.D.C. and the smaller sub caliber projectiles have 10 M.D.C. each. Each heavy mass driver is mounted in a special turrets that are partially recessed into the ship’s hull. The turrets have a limited firing arc. Each has a 30 degree arc of fire. Two are mounted on either side of the hull designed to fire directly forward. Maximum Effective Range: 16,000 miles (25,800 km) in space with range of 32 miles (51.5 km) in an atmosphere. Payload: 100 projectiles for each mass driver (200 total) -Usually 80 standard and 20 sub-caliber loaded projectiles per mass driver. Two (2) Cruise Missile Batteries: These replace the original cruise missile batteries. Missiles have a top speed of Mach 25 in an atmosphere and have an acceleration of 10% of light per turn (far faster than any starship) in space. Whether missiles can be shot down is calculated from the speed of target, launching starship, and missiles. When drive goes dead, missiles will continue to travel in a straight line unless set to self destruct or receives a destruct code, but have very low odds of hitting star ships (Great for hitting bases and planets because target does not move and missiles, when unpowered, are at -25% to be detected.) Cruise missiles have penalties to hit small targets but almost always smart missiles. Batteries can launch on multiple targets each at the same time. These are modern Consortium missile batteries similar to those carried on a number of warships. Payload: 64 total, 32 cruise missiles per battery. Ship has 6 reload of missiles (384 cruise missiles reloads total). Four (4) Long Range Missile Batteries: These replace the original long range missile batteries. Missiles have a top speed of Mach 20 in an atmosphere and have an acceleration of 8% of light per turn (faster than any starship) in space. Whether missiles can be shot down is calculated from the speed of target, launcher, and missiles. When drive goes dead, missiles will continue to travel in a straight line unless set to self destruct but has very low odds of hitting star ships (Great for hitting bases and planets because target does not move and missiles, when unpowered, are at -25% to be detected.) Long range missiles do not have penalties to hit small targets, unlike cruise missiles, and are almost always smart missiles. Batteries can launch on multiple targets each at the same time. Payload: 960 total, 240 long range missiles per battery. Payload: 128 per launcher for a total of 512 medium range missiles. Four (4) Mini-Missile Launchers: These are missile turrets used for point defense against enemy fighters and missiles. Missiles have a top speed of Mach 10 in an atmosphere and have an acceleration of 2% of light per turn in space. This is slightly faster than any starship except if it is exceeding it maximum safe acceleration. Batteries can launch on multiple targets each at the same time. Mini-Missile in the Phase World / Three Galaxies setting are normally smart missiles. Payload: 128 per launcher for a total of 512 mini-missiles. Cargo hold has an additional 2,048 mini-missile. Reloading launchers from cargo hold takes 1D6 minutes. Image drawn and copyrighted by "MK01".